It all starts here. Image source: Philippe Put. CC by 2.0. Click image for original source. I wish I had had my camera with me, because just the other day I saw something extraordinary. Something so rare that I thought it was almost extinct. I was, frankly, both shocked and excited! What was this rarity, this amazing vision? Picture this: I’m walking back from my local cafe/shopping strip on Main St in Osborne Park. An inner-city suburb in Perth, Western Australia. I’m walking down Hutton St, a very busy main suburban feeder road that leads directly to the Mitchell Freeway entries a kilometre away. It’s around 4.30pm, so the rush hour has started and Hutton St is packed with cars, heading for the Freeway and home. And then I saw it! Or should I say saw him. A young boy on a dazzling chrome and electric blue BMX bike came whizzing down Hutton St. He’s keeping up with the packed traffic, but he’s pumping hard on the pedals, out of his seat, and going for it. A quick glance left and right, over both shoulders; then he sits back down on the seat, expertly signals for a left turn, lays the bike over and turns hard into my own street, Edward St. He’s still flying, and now he’s back onto the pedals and pumping hard again, and that’s where I lost sight of him. Extraordinary! What’s so odd about that, you may say. Kids ride bikes don’t they? Well, do they? Or do they any more? And do they do it on their own, without mum or dad, on busy roads? They used to – Lord knows, I did when I was this boy’s age. But I simply cannot recall the last time I saw a kid – of any age – on a bike on Hutton St.
On the footpath, yes, sometimes, at a sedate barely-above-walking pace, normally carefully shepherded by a watchful parent on a bike or on foot. Often that’s entirely reasonable – little kids on bikes need supervision, even on footpaths. Sometimes it’s the ugly parent syndrome, with Mum or Dad barking constant instructions and warnings.Sometimes the “kid” who is being barked at is well into his/her teens. On the the road itself? Alone? Does not happen. You only occasionally see adult cyclists on Hutton St; never kids, and certainly never kids as young as this one. This kid was around 9 – maybe 10. He was seriously competent – he knew his road rules, he was totally in control, and he was not taking unnecessary risks. He was reading the traffic, he wasn’t weaving through it or tailgating the car in front. If he had been riding more slowly he would have been at more risk, not less, since he wouldn’t have been keeping up with traffic, he would have been passed by car after car. 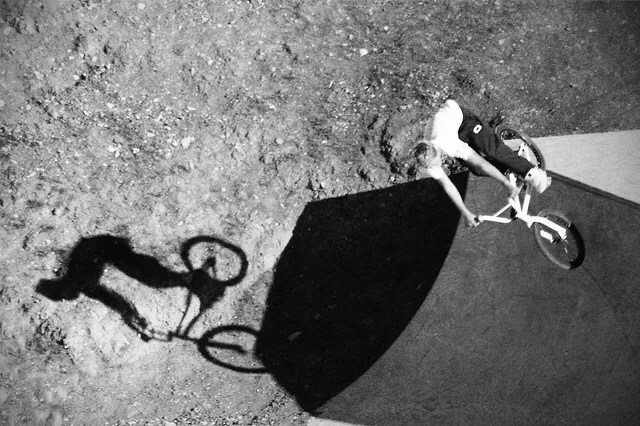 He was just a good rider, doing what good riders do – ride. He had the legally compulsory stack hat on – there are serious fines here for non-compliance with the cycle helmet laws. But what was keeping him safe – and I truly do believe he was safe (or as safe as any rider of any age, even an adult) – what was keeping him safe was not his stack hat. It was his skills and his knowledge. And you only get those skills and knowledge through serious practice. You can learn to ride a bike in a park or an empty car park. You can even do it on a driveway, or backyard or at school. But to learn to ride on roads, and to do it safely and competently there is only one method: you must ride on roads. And cyclists, including child cyclists, have every bit as much right to be on the roads as any other vehicle. 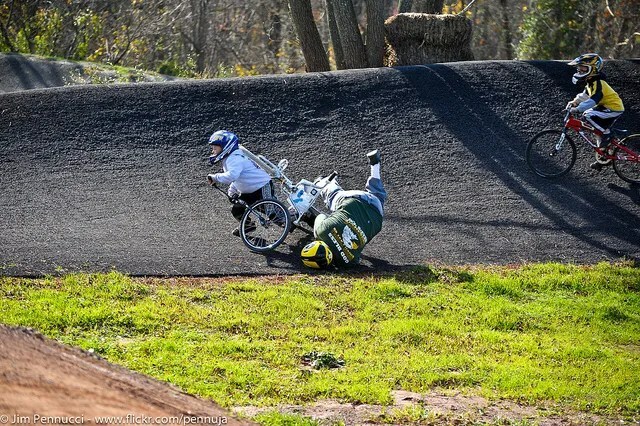 My guess is that this kid has been learning to ride practically since he learnt to walk. He’ll have started on a tricycle, maybe moved onto a 3 wheeled scooter. Maybe he went straight to a mini-BMX bike at around 3 – and I reckon the training wheels came off a couple of months later. At first he’ll have ridden under the close supervision of his parents. And only in safe areas where falling off is unpleasant, but not a tragedy – probably the local oval or park. You don’t learn to ride well without falling off a lot of times. Firm grass is a lot more forgiving than concrete or bitumen, but I’ve no doubt he was riding every day on that too. And gradually he must – MUST – have been introduced to riding on the roads. Quiet suburban cul-de-sacs; back streets; then gradually more busy streets. And at first I bet he had mum or dad watching him like a hawk, teaching him the road rules, teaching him about safety and how to deal with traffic (even quiet back streets get plenty of traffic). And as the hours on the roads mounted up and the lessons sunk in, as his skills developed and his knowledge consolidated, he must – MUST – have gradually been given more freedom and autonomy by his parents. They knew they could trust him; they did trust him: bit by bit, little by little, they let him spread his wings and fly. And so now, here he is: 9 or perhaps 10. No parent to cotton-wool him or yell that singularly useless phrase “Be careful!”. No one to tell him how to ride or what to do, or what is safe and what isn’t. No need: he knows. It’s embedded, right down deep in his brain, he doesn’t even have to think very much; by now most of what he is doing is instinctive. Because he has practised and practised and practised again. They say it takes 10,000 hours of practice to get really good at any physical skill. Piano, guitar, tennis, surfing – or riding a bike. My guess is that he had put in those 10,000 hours, or something close to it, since he first got on a tricycle at what? 15 months? He’s had the time if he’s dedicated enough. Assume he has been riding now for 8 years. That’s 70,000+ hours total time. A lot of that time he’s asleep or at school or doing other things, but even so, he has plenty of time to make his 10,000 hours – if he is given the opportunity to put the time in by parents who understand that here is a boy who lives and breathes cycling. I wouldn’t be surprised to find he’s into competition BMX racing or maybe Freestyle BMX. Putting in the hours at the track or the skatepark, training hard, trying new things, and falling off and getting back on the bike, over and over and over again. So: to the young boy I saw; to that extraordinary sight, that astonishing rarity (a sight that used to be an everyday, all-day occurrence in the past); to that young boy I say: “Go, you good thing! Crank those pedals! Proj on! Citius, Altius, Fortius!” But I don’t think he needs any telling. He knows he’s good and he’s justifiably proud of his skill. Want to know more about cycling and children? Do you want facts and figures, hard data from an internationally respected academic researcher and policy adviser on the subject? Here it is: Tim Gill’s huge (53 page) PDF report “Cycling and Children and Young People: A review” for the UK non-profit organisation, the National Children’s Agency. It’s all there: How much do children cycle? Is it decreasing over time? What are the rates of cycle ownership? How far do children travel and where? What are the risks? What are the benefits? What are the general societal attitudes to children cycling? What are children’s own attitudes to cycling? 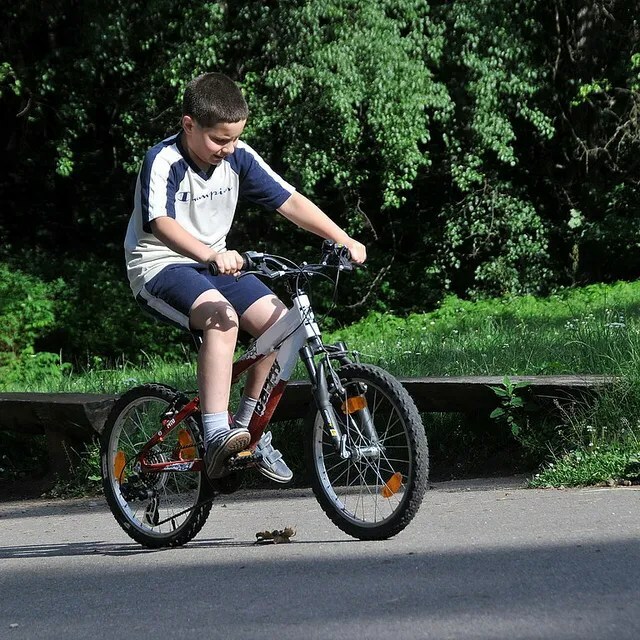 What policy initiatives increase – or decrease cycling rates in children? What about other countries – what can we learn from international perspectives and policies? What research has been done – and what remains to be done? What’s controversial? And what isn’t? What about safety? What policies, practices and facilities work to reduce injury? What don’t? Do helmets save lives and/or prevent injuries? And if so, how effective are they at doing so? Do the benefits of helmets outweigh their downsides? And much, much more, and all backed up with extensive hard data and fully annotated and with all the citations to all the research cited in the document. It’s not light reading- but it’s very readable! You don’t need to be a statistician or academic to read this paper, believe me! And if you just want an overview, not to read every word, there is a 4 page summary that lists all the key findings of the report. Thanks to Tim Gill for drawing my attention to this report – it’s essential reading! 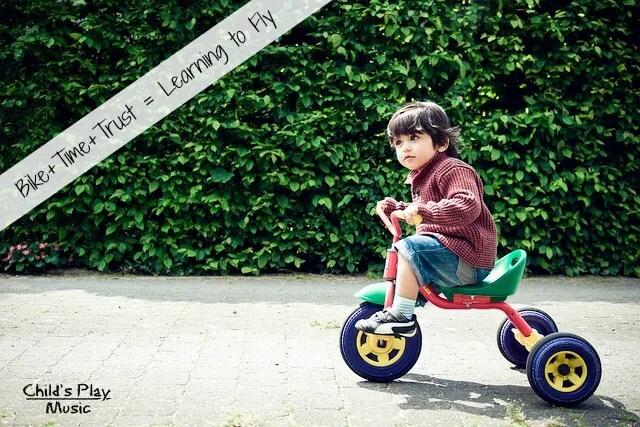 This entry was posted in Cycling, Outdoor play, Risk in play and tagged BMX, Child development, Confidence, Cycling safety, outdoor play, Parental trust, risk in play by Alec @ Child's Play Music. Bookmark the permalink. Like many incredibly old people, like myself, my first bike was built by my dad out of bits and it was he that taught me to ride. “No, I promise I won’t let go, no really” he said. Letting go. I also have lots of memories of riding my bike (say 10ish) from the garden gate, down the path to the garage, turning in front of the garage door (very tight turn) and back to the main gate … over and over again. Don’t get me started! The speed, the sense of skill, of turning, balance, independence, of hours spent practicing and internally competing, and of my dad. You brought it all back, Alec … Well done! Thanks Marc; My own first bike was a little 16 inch-wheeled BSA, bought second-hand from a neighbour, and fettled up by my Dad. I think I was 4, and I learned to ride on our big back lawn and I remember Dad letting go, too. And the thrill! The power! The sense of achievement as I rode off across that lawn – and promptly fell off! I fell off more times than I can count. I even fell off my next bike (a 20inch Raleigh) when I was 7, on a road, at a reasonable clip, when my front wheel got caught in a grating and it threw me over the handlebars. And it hurt! And I lost a fair amount of skin, and a little blood, and was generally bruised and shaken up. And I picked the bike up, straightened the front wheel and rode home, bawling my eyes out. But I did not stop riding, and nor would my parents ever have suggested I should do so. Falling off bikes happens. It’s normal. It’s all part of learning to ride. I learned to watch out for gratings, and to avoid them. Better to learn that then, on a bike with 20 inch wheels, than later on a bigger bike, with further to fall! Wonderful post, Alec. Duly shared. Thank you! Do you know the phrase “Praise from Sir Hubert”? As is so common, it’s a misquotation. The correct quote is “Approbation from Sir Hubert Stanley is praise indeed”, and it’s from Thomas Morton, an English playwright of the late 18th and early 19th century. I’ve been unable to find out who the Sir Hubert Stanley in question is. But nevertheless, praise (or approbation) from a writer as fine as you is, in my mind, absolutely “praise from Sir Hubert’! Love this!!!!! I rode my bike everywhere, but kids these days just don’t. It is definite;y becoming a lost art. Thank you, Ayn! And while it may be becoming “a lost art” I do not think it is lost yet, and I see no reason why it should become totally lost. I believe that it has merely been set back, that it is (in ecological terms) “endangered”. But as with any endangered species, with hard work and passionate people and good policy and sound practice we can restore the ecosystem of children and bicycles and reasonable attitudes to risk to full and vibrant health. Forward! You’re right. We never see them anymore. Kids doing anything really on their own. I would like to believe that I will have that same trust in my children. I truly hope I do when the time comes for them to spread their wings a little further… I really do. I believe that time is coming. I really do. Yet it’s going to take major change, not to get back to freedom for children, but to go forward to freedom. We can learn from the past, but not revisit it or recreate it. It’s a different world now than 50 years ago when I was a young child learning to ride my first bike. I’m no Luddite. In many ways the world is a much better place for children than it was when I was a child. I do not have fantasies of returning to some halcyon dream of a perfect world where everyone was friendly, where we all lived in houses with white picket fences and life was safe for all children. That world never existed. Horror, brutality and crimes against children were with us then – indeed much more so than now. Awful accidents occurred; terrible diseases were more prevalent. I myself would probably have died in early childhood if I had been born even a few years earlier. I had extremely severe asthma and I spent much of the earliest years of my life in hospital, in an oxygen tent; my life was utterly miserable and it was not a matter of if I would die, according to the doctors: it was only a matter of when. But then along came corticosteroids, and my life was utterly transformed and my “certain death” was averted. I do not want to go back; I am an optimist: I look forward. But I do dream of a better future. And that better future includes more freedom for children, and yes, more risk for children than most are currently allowed. Sensible, rational risk, and sensible rational freedom. Hopefully this is a look into a future full of daring and adventure, not just a look back at memories from the past. Good on you for noticing; good on the boy for doing what he did; and good on the adults responsible for this child to provide him with the opportunities to gain such skills. I know I wasn’t that parent when my kids were that age. That is EXACTLY my hope, Greg. That this is the future of cycling and the future of play, too. Because I really do feel that the pendulum is starting to swing away from the cotton-wooling and safety hysteria of the past 20 years or so and towards a great new vista of freedom for children and rational societal attitudes to risk. I hope I’m right, and it’s not just that I’m “in a bubble” of like-minded people, but I see more and more in the general media now about the importance of play and the importance of allowing children to learn to take risks. Risk exists; hazards exist; they are inescapable in life. We can reduce (but not totally eliminate) real hazards, but we can only learn to manage and assess risk through taking risks. Gradually, in tiny bite-size chunks, we learn what is safe (or safe enough) and what isn’t. No amount of sententious safety lectures and obsessive bubble-wrapping can prepare children to cope with risks: it’s the ultimate in “on-the-job” training; you have to DO it to learn it. Parents and educators can support children as they learn to manage risks, but in the end children end up as adults and at some point in their lives they have to take over full responsibility for assessing and managing risk. Lovely post Alec. It perfectly captures both the essence of learning to cycle, and the tragedy of young people’s typical cycling experiences today (closely chaperoned pootles around local or not-so-local parks and cycleways). Readers who are interested in a slightly more academic/policy oriented take on young people and cycling may want to read my 2005 report for the National Children’s Bureau [pdf link]. Thank you Tim! To get such a supportive comment from someone like yourself – an internationally-respected academic researcher and policy adviser on exactly this issue – is a real honour! I will include a link to your report as an addendum to my post. It will add significantly to the post, with its detailed data and evidence-based information providing a nice balance to my own observational story. And it’s too good and too important to be buried down here in the comments! My kids (9 & 11) get about by bike on the roads (this in Dundee, Scotland). Their friends generally don’t, limited to “toy” use rather than real transport. They have something of an advantage in that their dad is a cycle trainer, but to be honest there’s not anything much I’ve taught them that any reasonably competent and seasoned cyclist couldn’t have done. One of the things I do have that most parents don’t is a fair grasp of the real risks involved so I’m more inclined than many to get them out on the roads without forcing them to dress up like low-rent Dayglo Power Rangers: Tim’s report is very good in summarising the available evidence. Get the whole family out on the road and soon everyone will be fitter, the kids more independent and the parents richer. If parents cycle they can teach and support the kids. The risks are real – some people, including children, do die or get serious injuries when cycling (whether cycling on roads or not). But it is not particularly hazardous, especially on a per kilometre travelled basis. And any activity that on average will take half a million years to kill you is not a very dangerous activity! But parents are genuinely frightened: their perceptions of the risks involved to their children is badly skewed, partly, I believe as a result of bad journalism and sensation- hungry media outlets. Any child’s death or serious injury is a tragedy for both the child and the child’s family. But it’s also a tragedy if millions upon millions of children become obese and suffer serious preventable disease and an earlier death because of lack of healthy, vigorous outdoor activities like cycling. And similarly it’s also a tragedy if millions upon millions of children grow up without freedom and self-assurance and an ability to assess and manage their own risks, and grow up without wings to fly. I don’t often reblog, but just occasionally I see a post that is so in the spirit of I do not despair that it has to be shared. Many thanks to Carlton Reid and Tim Gill who brought it to my attention through Twitter. More musings on this to come perhaps. I very rarely re-blog but this is one of the most refreshing bits of writing on cycling I have read for ages. Thank you. I think, or rather I hope my now 21 year old son carries some of the spirit of this boy with him, and I hope that the 10 years I spent developing cycle training in the UK might just bring on more kids who have similar skills. I’m honoured to be featured on your blog, Kevin. I don’t mind it at all when people do what you have done ( a short excerpt, and a link to my full post, with additional material of your own). It benefits both of us; for a start, it meant I found your excellent blog! And of course, you’ve sent extra readers my way, no doubt I have sent readers your way, and every blogger wants more readers, don’t they? It’s only when people copy a whole blog post word for word that it becomes an issue. Google hates that! It can adversely affect the Google ranking of both sites, and in some cases it is serious copyright infringement (I know of one blogger whose whole blog – every post, every word, every image – was stolen and duplicated). What an amazing reflection- We all need to learn how to fly and to give our children that ability too! I have highlighted your post as one of my “Friday 5” today. Thanks Amy – Child Central Station is an excellent blog and website, and I’ve been an admirer of your work for some time. So to be featured in the first of your “Friday 5” round-ups makes me very happy indeed. I’ve grabbed your button for my sidebar but unfortunately this particular WordPress Theme only has a sidebar for the main blog page, not for individual posts. I’m planning to migrate to a different Theme soon that should fix that issue. 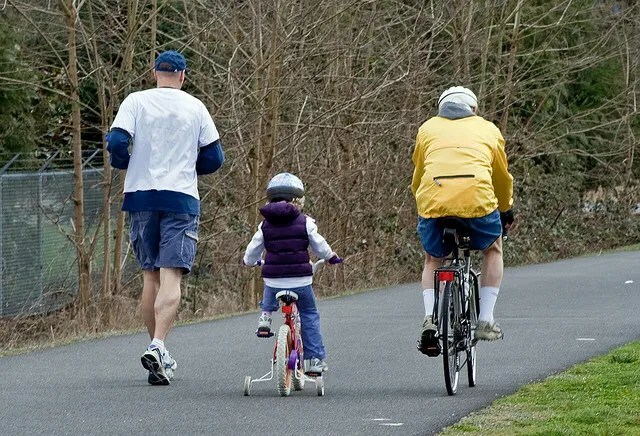 You are so right that we don’t see kids out biking much anymore. In fact, I don’t see school age kids out at all much anymore unless they are doing an activity like soccer. That makes me really sad and I wonder what our society is going to miss out by not allowing our children the time and experience with free outdoor activities like biking. And you are right that teaching street awareness starts very young and biking is a great way to teach kids safety and freedom. Thank you for linking up to the Outdoor Play Party! I thoroughly enjoyed this post! As a child I was sent out in to the “big world” (dairy farm) to ride my bike all over. I remember it being a great adventure that I enjoyed. I didn’t have parental supervision for many hours at a time but I knew to be home when the sun was setting. Somehow I managed to survive. 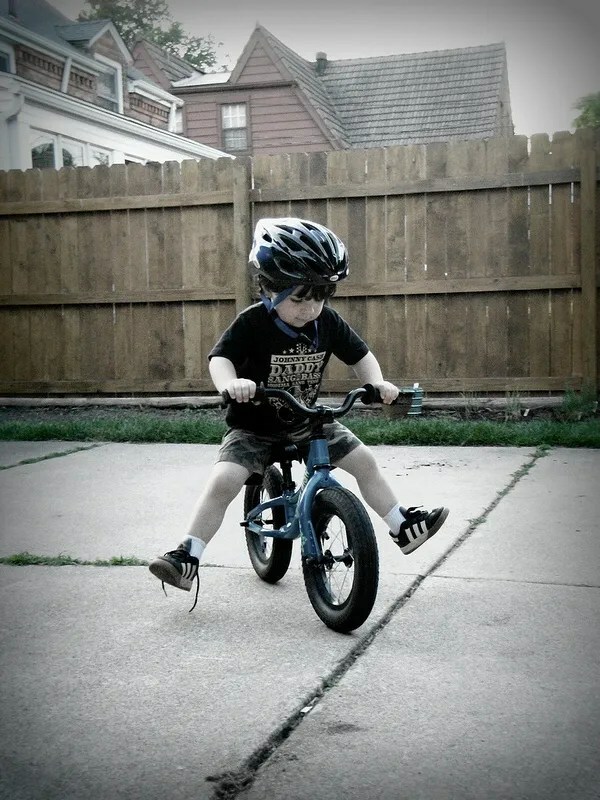 I have 2 littles now (18 & 39 months) and I can’t imagine them being allowed the same freedom I had….The thought of them riding a bike in the road (and a busy one) makes my heart race….am I developing ugly parent syndrome?? or helicopter parent, I’ve also heard???? Maybe it’s just because they are currently so little? I certainly want them to learn to be capable and competent to take care of themselves without momma always by their side. Your post has got me thinking…. I thoroughly enjoyed your post! As a momma of two littles, you have me thinking. If you liked that, you’ll love this video of my boys and a friend playing in our driveway. I’m a big proponent of letting boys play, of letting them find their own limits. The way I see it, the benefits of learning to fly far outweigh the risks of possible injury. Physical injuries heal; psychological limitations don’t heal nearly as well. That’s cool, Jennifer – thanks for sharing it! And I agree entirely that the benefits outweigh the risks: there’s good evidence that children who don’t get the opportunity to take reasonable risks and play freely are more likely to develop anxiety and/or depression. It is great to find this post! About 14 years ago I created a bike school for adults who didn’t learn to ride. We thought over 4.000 people, 85% were women to ride a bike for the first time. When they were kids thought bikes were for men or city trafic didn’t let them to practice. The method we developed it was based in balance and we never touch them. Now we are also recomend it for children. I’m starting a project to remember the day you learn to ride a bike. I let you know as soon as I start it. We should give that moment the importance it deserves: they learn to fly and makes life simply more exciting!